We are delighted to announce that we are a recipient of funding from the Department of Culture and the Arts (DCA) under their Connect Community Collections Funding Program 2012. Our funding is to assist in the development of additional virtual exhibits and the online digitisation of historic booklets - both with the purpose of promoting our collection to a broader audience. 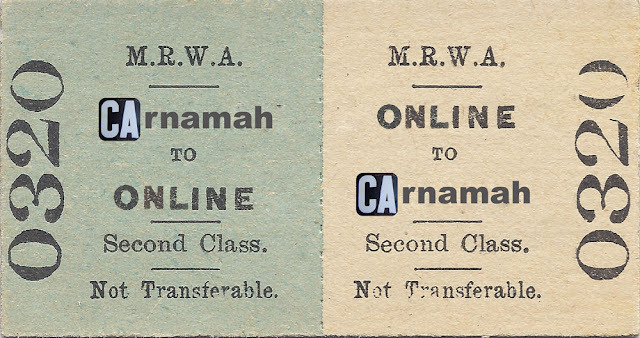 "Carnamah to Online - Online to Carnamah"
A new virtual ticket to our collection! The Virtual Museum on our website will receive an additional six exhibits. Two of these themes will combine objects from our collection and that of the Shire of Carnamah. We will also be digitising and publishing online 18 booklets, most of which will be agricultural show schedules from the past century. Show schedules are an often overlooked treasure that provide an annual snapshot of local trade and businesses. We are looking forward to delivering a selection of them from cupboard shelves to wherever you are! Work will begin later this year and will be concluded in 2013 to coincide with the centenary of the gazetting of the Carnamah townsite. We will be chronicling the process and progress of this project on our blog. To keep updated simply follow us here on Blogger or on Facebook, Google+, Twitter, Pinterest or LinkedIn. Our thanks go to the Department of Culture and the Arts (DCA) for supporting us in this exciting project.